A rich blend of botanical ingredients and their professional quality formulas make up the Botanique line. Always on the look-out for natural ingredients? Stop the search! 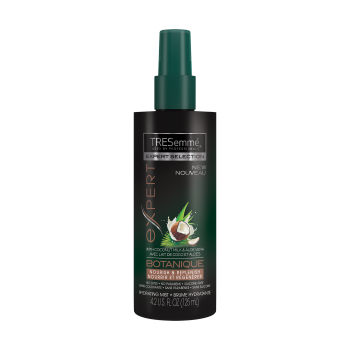 TRESemmé has found a way to blend nutrient-rich botanicals with their professional-quality formulas. The result? TRESemmé Botanique: a collection completely free from parabens and dyes, to help reveal your hair’s natural beauty. Daily hair styling and product build-up can take a toll on all hair types. The TRESemmé Botanique collection is made up of three different systems to help you tailor the perfect detoxing package to get your hair back into balance. TRESemmé Nourish & Replenish system is ideal for thirsty, frizzy hair in need of a moisture boost, whilst the TRESemmé Damage Recovery system is there for hair that’s been through a lot. Enriched with oils and proteins, the luxurious Oil Elixir leaves locks shiny looking. Cleanse and condition with TRESemmé Detox & Restore system to purify your tresses of any excess oil or product build-up, revealing weightless hair that’s full of movement. I tried the Nourish & Replenish line. TRESemmé BOTANIQUE Collection. Their professional-quality formulas, with botanical blend, are free from parabens and dyes and will brign out your hair's natural beauty. 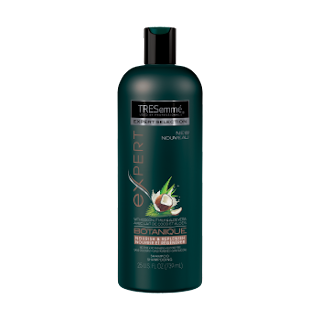 The TRESemmé Botanique Nourish & Replenish Shampoo gently cleanses hair while leaving it nourished. This shampoo is free from parabens, dyes and silicones and enriched with their botanical blend of coconut milk, coconut oil and aloe vera. Their professional-quality formula simultaneously cleanses and quenches hair each time you lather up, for healthy looking hair. For best results: apply to wet hair, gently massage the scalp and roots with fingertips to work into a lather. Lightly squeeze the shampoo from roots to ends and rinse thoroughly. 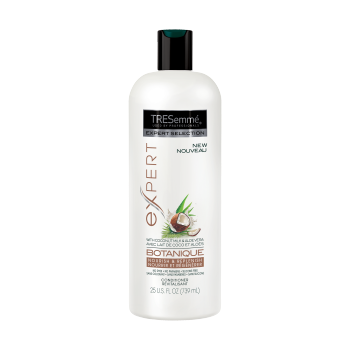 Follow with the TRESemmé Botanique Nourish & Replenish Conditioner. To maximize nourishment and a moisturized feeling follow with TRESemmé Botanique collection treatment products. How does it work? Nourishing shampoo infused with coconut milk and aloe vera simultaneously cleanses and quenches for healthy looking hair. Also infused with coconut milk and aloe vera, TRESemmé Botanique Nourish & Replenish Conditioner smooths and silkens hair. They love the ingredient trend too. So they found a way to marry rich botanical ingredients and their professional quality formulas to get head turning hair with the TRESemmé Botanique Collection. Their professional-quality formulas, with botanical blends, are free from parabens and dyes and will bring out your hair's natural beauty. The TRESemmé Nourish & Replenish Conditioner detangles and hydrates to leave hair smooth and silky. This conditioner is free from silicones, parabens and dyes and enriched with their botanical blend of coconut milk and aloe vera-known to be nourishing. Their professional quality formula smooths, nourishes and detangles while you rinse, for healthy-looking hair. To use: start with TRESemmé Botanique Nourish & Replenish Shampoo. Then use the Nourish & Replenish Conditioner. Squeeze a generous amount of conditioner into palm and rub hands together. Apply to damp hair, focusing on ends to mid-lengths first. Then work any remaining conditioner up towards the roots. Leave in for 2-3 minutes then rinse thoroughly. To maximize nourishment and a moisturized feeling, follow with TRESemmé Botanique Collection treatment products. How It Works? The nourishing conditioner is infused with coconut milk and aloe vera. It simultaneously smooth and silkens for healthy-looking hair. The TRESemmé Botanique Nourish & Replenish Hydration Mask is infused with coconut milk and aloe vera. It deep conditions for serious hydration that leaves hair amazingly soft. 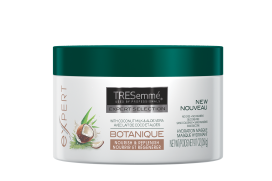 The TRESemmé BOTANIQUE Nourish & Replenish Hydration Mask with their botanical blend of coconut milk and aloe vera gives hair a surge of intense hydration to leave it soft and silky. The advanced technology gives the power-packed formula detangling and nourishing powers. The masque deep conditions for a serious hydration hit that leaves hair amazingly soft. To use: Step 1. Start with TRESemmé Botanique Nourish & Replenish Shampoo. Step 2. Apply a generous amount of mask evenly from mid-shaft to ends. Step 3. Leave on 3-5 minutes and rinse thoroughly. Use once a week as needed. Complete your look with your favorite TRESemmé Styling Products. How it Works? The hydrating mask, enriched with coconut milk and aloe vera, deep conditions for serious hydration that leaves hair amazingly soft. Enriched with coconut milk and aloe vera, known to be nourishing, the TRESemmé Botanique Nourish & Replenish Hydrating Mist is lightweight, it conditions, detangles and preps hair for styling. It smooths, conditions and gently detangles hair to leave it beautifully hydrated and ready for styling. The professional formula has lightweight moisturizers that will not weigh hair down. Enriched with coconut milk and aloe vera, known to be nourishing, this lightweight mist conditions, detangles and preps hair for styling. To use: Step 1. Start with TRESemmé Botanique Nourish & Replenish Shampoo and Conditioner. Step 2. Spray product throughout towel dried or damp hair. Step 3. Run a wide-tooth comb or your fingers from roots to end to fully coat hiar and detangle. Style hair as usual with your favorite TRESemmé Styling Products. How It Works? This lightweight mist, enriched with coconut milk and aloe vera, conditions, detangles and preps hair for styling. I was very happy with the Botanique Nourish & Replenish line of TRESemmé products. When you first open the bottle what captures you is the aroma. The smell of the products is absolutely divine. I really love how the products smell. Then I used them. My hair looked great. I color my hair and I must say, my color did not fade much nor did it look worse for wear after using these products. These products did what they were supposed to do: they hydrated my hair, detangled it, made it feel soft, made it feel smooth, made it feel silky, and in all generally my hair felt great. It also got rid of my frizz, which is what it is supposed to do. That is the clincher for me. Anything that can help with my frizziness is perfect for me. Also, their prices are very reasonable and I do believe the products work great. I was very happy with the results I achieved with them. I would not mind trying out the other Botanique lines too. These items can be found online at www.amazon.com and in Walgreens or Walmart stores. Like TRESemmé on Facebook: http://www.facebook.com/tresemmeus; Follow TRESemmé on Twitter: @TRESemme; Follow TRESemmé on Pinterest: https://www.pinterest.com/TRESemme; Follow TRESemmé on Instagram: https://www.instagram.com/tresemme/; Subscribe to TRESemmé on YouTube: https://www.youtube.com/user/TRESEMME and Follow TRESemmé on Tumblr: http://tresemme.tumblr.com/.